Many of the following can be purchased from Amazon. 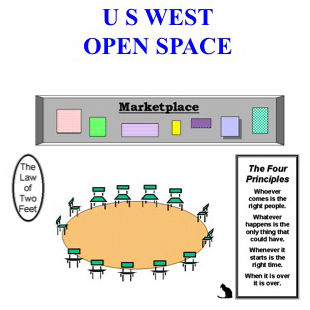 Some materials have been available through the Open Space Institute(US), whose bookstore is currently closed. See also the titles that can be downloaded for free, listed below the books and videos for sale. BOOKS BY HARRISON OWEN AND OTHERS – sold online at a discount to bookstores’ prices. Wave Rider: Leadership for High Performance in a Self-Organizing World – Shows how to apply the fundamental principles of self-organization – the driving power behind OST’s immense success – not just to a single event but to the day-to-day management and leadership of organizations. Harrison Owen, (Berrett-Koehler, 2008), paperback, 246 pages. List: $24.95; Our price: $20. Open Space Technology: A User’s Guide, 3rd edition – All you ever wanted to know about facilitating an Open Space event. Included are the specifics about time, place, logistics, invitation and follow-up. Special attention is devoted to the preparation of the facilitator. Harrison Owen, (Berrett-Koehler, 2008), paperback, 200 pages. List: $29.95; Our price: $24. The Spirit of Leadership: Liberating the Leader in Each of Us – Everybody says there is a crisis in leadership. Some would even say that all the leaders have gone. Actually, there is plenty of leadership and it resides in all of us. When nobody is in control we all are. The Spirit of Leadership describes, in very practical terms, the rights, duties, obligations, and opportunities of the new leadership, which is us. Harrison Owen, (Berrett-Koehler, 1999), paperback, 180 pages. List: $15.95; Our price: $13. The Power of Spirit: How Organizations Transform – Harrison Owen offers his reflections that real transformation does not result from corporate mandate but from the expression of the spirit and passion of the people in the organization. He suggests ways to release this spirit and dissipate the “Soul Pollution”-apathy, stress, and exhaustion-that plagues today’s workforce. Harrison Owen, (Berrett-Koehler, 2000), paperback, 260 pages. List: $19.95; Our price: $16. Expanding Our Now: The Story of Open Space – OST creator Owen offers numerous examples to illustrate the evolution of OST. He explores what it is, how it developed and how and why it works all over the world, for groups of all sizes dealing with a vast range of issues. Owen shows how OST can move organizations to higher levels of performance, without elaborate training or professional facilitators. Harrison Owen, (Berrett-Koehler, 1997), 200 pages. List price: $24.95; Our price: $20. 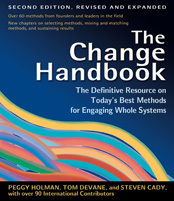 The Change Handbook: The Definitive Resource on Today’s Best Methods for Engaging Whole Systems – the most comprehensive guide available to methods of organization and community change. This second edition is designed for quick and easy access to information about high leverage change from today’s foremost practitioners. Change methods that systematically involve groups of people create more productive, more personally enriching organizations and communities. While a high-involvement, systemic approach to change sounds appealing, it is tough to achieve. The second edition of The Change Handbook presents 61 proven change methods together in one volume so that readers can learn about the diverse array of approaches being successfully employed today and choose the method that will work best for them. Peggy Holman, Tom Devane, Steven Cady and over 90 international contributors, (Berrett-Koehler, 2007), paperback, 736 pages. more info List: $59.95; Our price: $50. 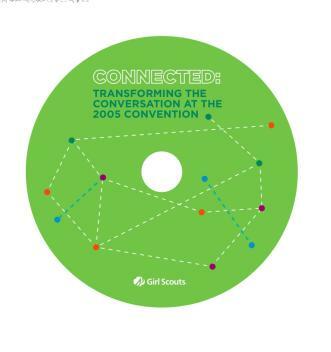 Genuine Contact Program Session 1: Working with Open Space Technology – This 2-hour Audio Video CD ROM set includes the training components of the Working with Open Space Technology workshop as facilitated by Birgitt Williams. The Video CD can be viewed in your computer to review the various components of Working with Open Space Technology. You could choose to work through the activities annually to deepen your understanding of OST, or view specific components as you prepare for a meeting. Keep the audio CD in your car to listen to on a long drive, plug it into your computer and listen while you work or transfer the files to your iPod. The package also includes a copy of the accompanying Workbook for deeper reflection. Anyone who has completed Open Space Technology training with any facilitator can purchase a copy of the CD ROM set. Visithttp://dalarinternational.com/cgi-bin/online/storepro.php to purchase. 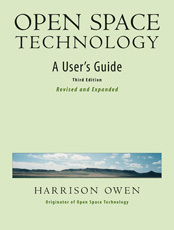 Open Space Technology: A Brief User’s Guide– http://www.openspaceworld.com/users_guide.htm – by Harrison Owen. This is the original publication that got space openeed all over the world. 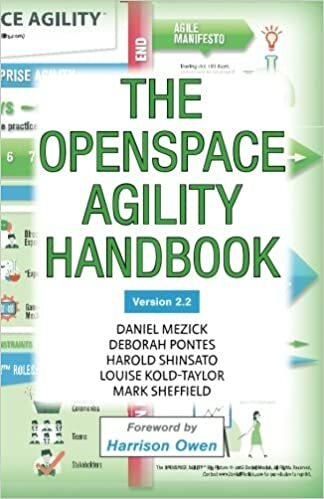 It has since been updated and revised a great deal and is available at [Open Space Technology: A User’s Guide, 2d Edition]. Open Space Technology: A User’s NON-Guide – MichaelHerman:OpenSpaceTechnology/UsersNonGuide – written by 37 practitioners worldwide, discovered and compiled by MichaelHerman? and ChrisCorrigan?. Offered here as a companion to Harrison Owen’s “User’s Guide,” in support of all the non-doing that is Open Space. Tales From Open Space – http://www.openspaceworld.com/Tales.pdf – a collection of stories of early applications of Open Space Technology, editied by Harrison Owen. Spirit: Transformation and Development in Organizations – http://openspaceworld.com/Spirit.pdf – Harrison Owen’s first book, which charted some new directions in what has become known as Organization Transformation. Riding the Tiger: Doing Business in a Transforming World – http://openspaceworld.com/tiger.pdf – Harrison Owen bridges the gap between the thoughts relating to Spirit and Consciousness offered in Spirit and the world of Open Space Technology. The original “User’s Guide” appears at the end of this book. Other titles by Harrison Owen – http://openspaceworld.com/literature.htm – titles available for purchase and/or download.